Geoff Gardner | Consolidated Planning, Inc.
After graduating from Clemson University in 1995, Geoff spent 4 years working for a small engineering firm before entering the financial services industry. 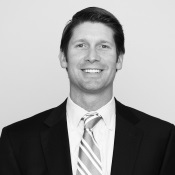 Geoff joined Consolidated Planning in 2000, and is currently working out of the Winston-Salem, NC office. Geoff takes tremendous pride in being able to help his clients reach their full financial potential. Through macro-economic planning strategies, Geoff helps his clients achieve their goals and create overall financial independence with certainty, not luck. Geoff holds his series 6,7,63, and 65 securities registrations, along with his Life & Health, and Long Term Care licenses: and is an Investment Advisor Representative. Geoff, a Lexington, NC native, is very active in his community. Geoff has served multiple terms on the Board of Directors of both the United Way of Davidson County and the J. Smith Young YMCA. Geoff has three children, Grayson, Harrison, and Elle. Geoff enjoys attending his children's sporting events as well as playing tennis, golf and basketball in his spare time.